And these radishes are the same variety, sown the same day in open, unimproved soil. 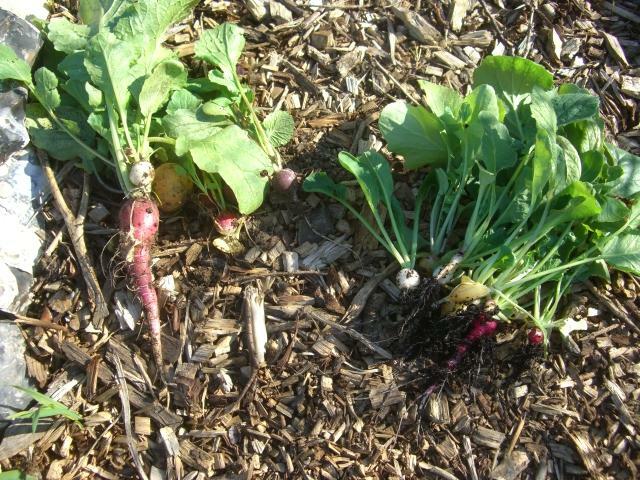 Open ground radishes on the left, cube radishes on the right. 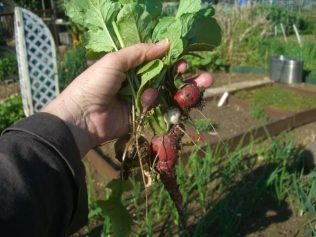 We made our first harvest of one of the two agricubes on plot #103. This picture shows the cube on 1 June 2012. As you can see, the salad leaves are doing well on all sides of the cube, the white Lisbon onions in the bottom slat are starting to fill out and the broad beans planted in the top have set pods. 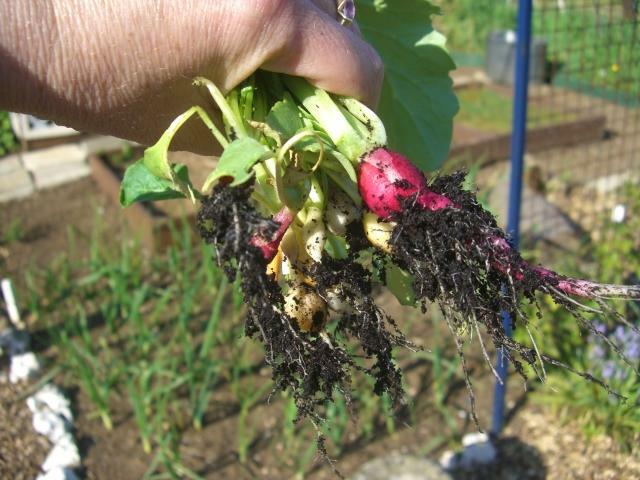 It’s definitely a productive planter in that regard! 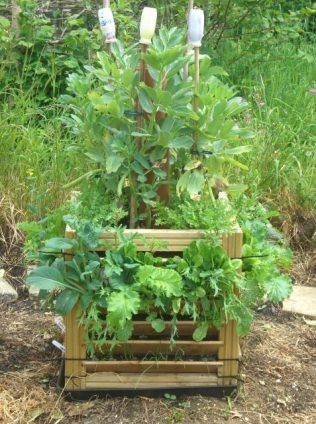 Next year I think we might put peas in the top rather than broad beans, as they become less top heavy and prone to sway around in strong winds. 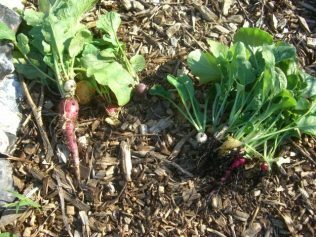 While there was little difference in the growth pattern of salad leaves in the planter and in open ground, we found that the radishes showed a significant difference when compared to the crops grown in open ground. The comparison between the two growth patterns is interesting. The other planter is being stocked more slowly. 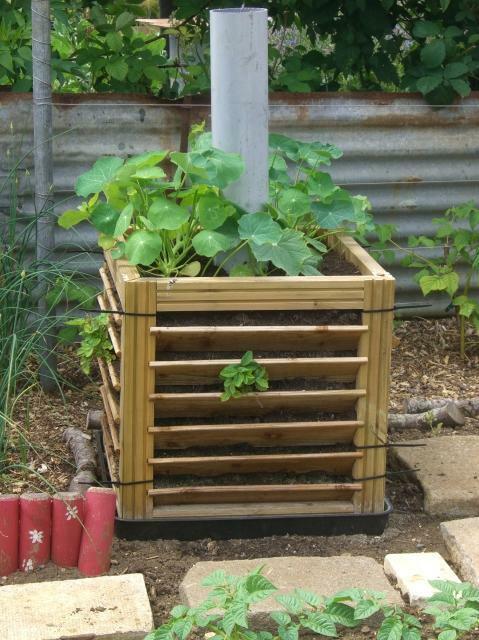 Apart from the growing space at the top, which will be used for annual plants, the idea is to create a perennial planter and so far it contains some alpine strawberries – it will also have chives, thyme and other herbs as they are ready to be planted out. The top of this planter currently holds a couple of nasturtiums which are just there to stop cats and foxes using it as a toilet, while the outdoor cucumbers reach a growth point that allows them to be planted out. The first of them went into the top of the cube in the last week of May and the second one will go in during the first week of June. Our chosen watering system seems to be working reasonably well, but we are seeing heavy rain causing a lot of soil to be washed out or splashed out of the spaces between the slats on the perennial planter. This suggests that is better to plant the entire cube, as we did with the salad planter, and hope the crops get established quickly enough for their roots to act as soil anchors before any really heavy rains.